I scored some awesome fleeces last weekend at Yarnival! Even better, they were TEN DOLLARS a fleece!! I promised a few friends there that when I got home I would share my fleece washing process. Everyone has their own twist- this is how I do it. First I skirt my fleece. Even if I buy a ‘skirted’ fleece, you never know if the person skirting considers clean, so I always like to do it again myself. I unroll the fleece onto a sheet outside (some people have a skirting table, which is a screen with large holes over a frame so the dirt and second cuts can fall through. One day I will have one…) so until I have a skirting table, I use a sheet. As I go through the fleece, I make 3-4 piles- the clean fleece, the dirty (fleece with tarry tips or more VM) and any belly/neck. Most of the time I get just the “blanket” fleece, which doesn’t include belly or neck (coarser part of the fleece) so I don’t have to worry about separating that out. Belly/Neck is good for outer wear, rug yarns and other items that won’t touch the skin. Don’t always send it directly to compost, sometimes there’s nice wool in there! I also have a “garbage” pile. This is anything with poop tags or what is too full of vegetable matter (VM) to deal with. 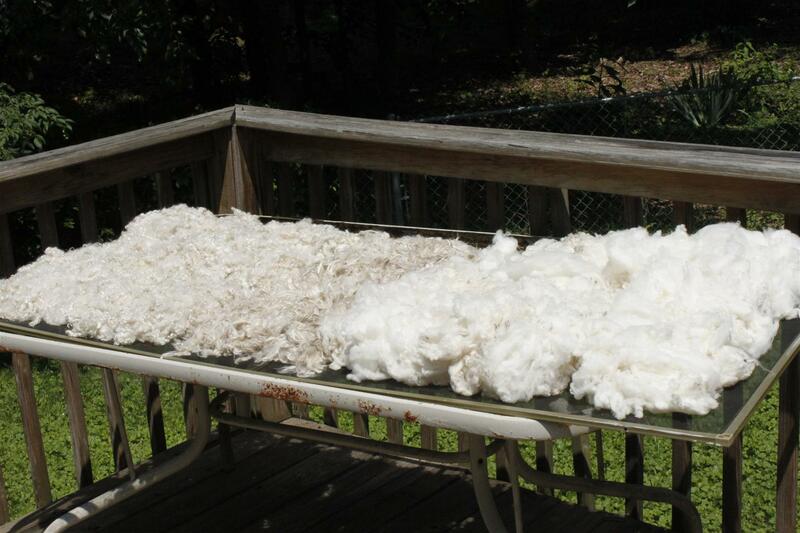 Your fleece will be as clean as it’s dirtiest part.. meaning it’s important to separate the fleece into piles. Your clean pile will wash much easier when it’s not getting dirtier because it’s being washed with fleece with more VM. After I have my piles, I put them into my baskets. Rather than lingerie bags, I use market baskets to hold my fleece/locks together as I wash. I find I keep wonderful lock structure without felting. The lingerie bags casused the fiber to shift around more than I liked and I found I was getting some matting. Felting occurs when the fiber goes from hot to cold, or when it’s agitated in the hot water- so I like to keep the fiber as untouched during the washing as possible. I use market baskets I’ve purchased from my grocery store. The baskets with holes work the best, I find I can get 1.5-2lbs of fiber in each basket. I put the baskets of fiber in large rubbermaid tubs of cold water and let them sit for 24 hours. This cold soak helps loosen and remove dirt. Just like soaking a stained garment. After the cold soak I pull the baskets out to drain while I empty the tubs and fill them with REALLY HOT water. It is important to get your water above 120 degrees, because this is what you need to melt the lanolin from sheeps wool. For Alpaca you don’t need to use hot water since it’s not a grease fleece- cool/room temp water works just fine. I find I need even HOTTER water for kid mohair, and the heavy grease fleeces (cormo, rambo and merino). Once the tub is full I add a glug of ammonia (this will cut the grease- again not necessary for alpaca) and a heavy squirt (around 1/4c) of ORIGINAL NO ENZYME Dawn. (the NO enzyme thing is very important, since those enzymes will eat at the wool and destroy the integrity of the fiber) I know some folks also use Unicorn Power Scour with great results. I haven’t used it yet, but I have some samples that I look forward to playing with. I let this first soak go about 15-20 minutes. It’s important NOT to let the water cool- this will allow the melted lanolin to redeposit onto the wool. After about 15 min, pull the basket out of the water and let it drain while you empty the tub and refill it. Unless the fleece is exceptionally clean, you will probably need one more wash (maybe even 2 if it’s a really dirty fleece). Think about what your plan is for the wool, and then decide how much washing you want to do. If you are dyeing the wool, you’ll get hot enough to melt lanolin in the dyepot, and then you’ll wash the yarn to set the twist, so you want to leave some lanolin in the wool so it doesn’t get overscoured after dyeing. It’s important not to overscour the wool, because it will loose it’s luster and softness and feel like ‘dry hair’ If you are doing more washings, do the same thing as the first wash except this time WITHOUT the ammonia. You only need that step once! Just make sure you are going from HOT water to HOT water- if you put the wool in cooler water it will felt. Also, don’t mess wiith it much in the soapy hot water! Maybe one or two turns so all the wool gets washed, but not more or you can also cause felting! Once you are going to start rinsing, pull the fiber baskets out to drain and empty and fill the tubs with clean hot water. Soak for 5-10 min to let the water get into the entire fleece. Pull the basket out and let it drain again. Do this again to remove the rest of the soap. I usually like to do one last rinse to make sure all the soap is out. On this last rinse I add 2 glugs of white vinegar. This will add luster and softness to the wool. This works with mohair, alpaca and wool! After the last rinse I put the wool in my washing machine and spin the water out on the spin cycle (I have a top loader). I take the fleece outside to dry on an old window screen. If you are dyeing the wool, you don’t even need to wait for it to dry- throw it right into your dyepots and go! Why don’t you use your washing machine like I’ve seen other people do? -I don’t use my washing machine because I wash SO many fleeces I just can’t imagine that it doesn’t hurt the washer somehow. I know how I have to clean my tub after washing 5 fleeces, I just can’t think that’s good for the machine. Someday I’ll have my own studio with an old washer that I can use for fleeces. I know some folks have great results from using their washer- I just did it once and was horrified at what was left behind. Do you dump your water down the drain? -I dump the first 2 washes outside into my garden. This is the water with the most grease. If you have a septic tank you shouldn’t dump any water down the drain since it can screw up your septic system. I have city water, but I have a fear of gumming up the pipes, so I dump the greasy water outside, then the later wash and rinse water can go down the drain. Can I go from cold water to hot without felting? -Yes. Hot water opens the scales of the wool, cold water closes the scales, so going from cold to hot will not cause felting, but hot to cold will cause the scales to clamp down and the wool will felt. If you have any other questions feel free to ask and I’ll answer the best I can. I’m working on making a fermented suint bath, which is a way in which the fleece’s natural greases create soap.. I’ll post when I have enough experience. ← Stitches Midwest Preview and Etsy Update! Thanks for posting your process. It is always interesting to see how other people do things. We have had a lot of success with the fermented suint baths. Anxious to hear your thoughts. Not sure what kind of baskets you are talking about. Margaret, I think she means the kind that they have on hand at the grocery store to carry your groceries in, if you don’t want to use a cart.